These darling wren houses are printed with striking floral images from Spring Hill Nurseries® photographer, Jen Nova. 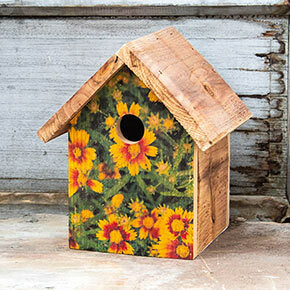 Now the same beautiful art that inspires gardeners on our website and in our catalogs will delight in your home garden. 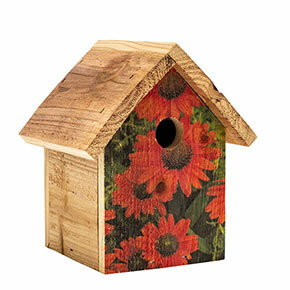 Choose from bright red coneflowers and cheery yellow–and–red coreopsis. The small entry hole and cozy size is just right for little birds like wrens, chickadees and nuthatches. 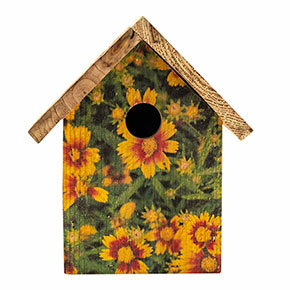 The house is made of cedar, which is a softer wood and easier for young birds to grip. It's also a sturdy, long lasting material. A metal panel on the back allows for easy access when it's time to clean at the end of the season. 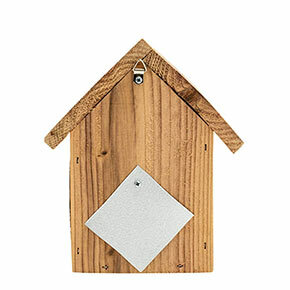 There is also a small hook on the back to hang your birdhouse. If your environment is prone to harsh weather conditions, you may want to protect this house with a clear urethane coating. 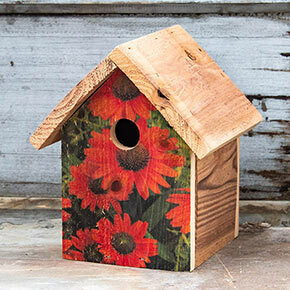 This quality birdhouse is made in the U.S.A., in a Shelter Workshop by Scenic River Industries. 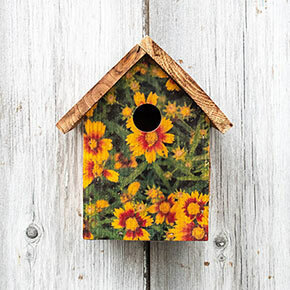 Here, individuals with physical, mental and emotional impairments can enjoy fulfilling, stable employment, crafting beautiful products such as these birdhouses. H9¼"xW7½"xD7"